The Lemon Fizz Kolorscape is a beautifully rich yellow shrub rose whose color remains from its bud to the spent flower. 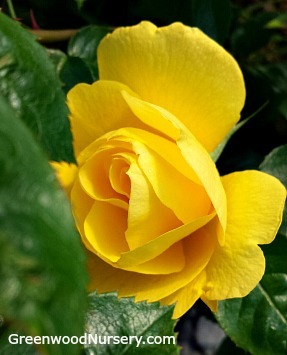 The dark green foliage of the Lemon Fizz Rose shrub provides a striking background for the bright yellow flowers. A compact flowering shrub that rarely needs to be pruned for shaping. Finally a fragrant flowering shrub rose that is heat tolerant into zone 9. With a mature height of 3 to 4 feet tall and only 2 to 3 feet wide, the Lemon Fizz Shrub Rose is perfect for low growing hedges, container gardens, foundation plantings and colorful focal point settings. Lemon Fizz Kolorscape Shrub Rose is grown in a full gallon container. Orders shipping to AZ and CA addresses will be bare rooted before being prepped for shipping. Trying to order but website won’t let me Add to cart. As noted immediately under the pricing, this item is not currently available.